Labor Day can be a blast. Who doesn’t love a three-day weekend? However, it can also be a bittersweet occasion where we wave goodbye to summer in favor of cooler weather. 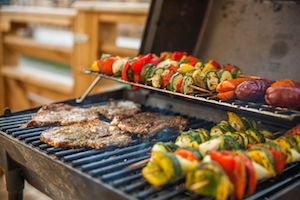 Whatever your view of Labor Day is, here are tips for cheap barbecue food and low cost barbecue ideas to use this weekend. Prepping for a Labor Day barbecue this weekend? When cooking for a crowd, stick to cheaper cuts of meat like whole chicken or flank steak. Not to mention that hamburgers and hot dogs are perennial cookout favorites that are also cheap and easy to make. When it comes to sides and smaller food items, sometimes it may seem worth it to grab something quick at the nearest grocery store. And, while pre-cut veggies might save time, they do not save money, as pre-cut veggies are 50-75% more expensive than fresh veggies. You will pay the additional cost of convenience and can save time by doing the prep work yourself. Potlucks are a great way to share the burden of planning a menu, and BYOB events allow guests to share their favorite beverages with the group. When extending an invitation or making plans with friends and family, ask them to bring their favorite dish or beverage. Not only is this a great way to try new things, but it helps take some of the work out of hosting and guests are typically more than happy to contribute to the occasion. Check your local grocery ads when planning your menu for seasonal produce and sales on these items. Summer gives us some of the best produce during the year and towards the end of the summer, items like peaches, watermelon, squash and peppers are in season. Planning your menu around in-season items and taking advantage of these sales can help you save money when hosting. The Dollar Store or sections in stores like Target’s “The One Spot” are great places to look for seasonal decorations that may only get used once or every so often. Here you can find great things to hang and set out, serveware, and festive accessories to set the mood for your event. What are your favorite tips for entertaining? Share with us on Facebook!